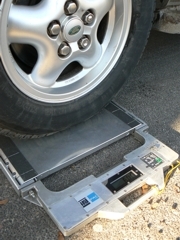 The demands on calibratable, static wheel load scales are versatile. CAT offers a large variety of wheel load scales (capacities from 1t to 15t). Because of its robust design SAW wheel load scales are applicable in rough environments and on non-ideal, rough road surfaces. They are mainly used by police and other road authorities for weight enforcement. 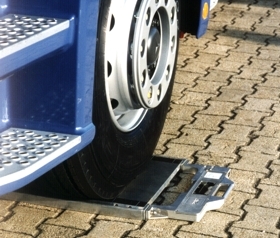 For measuring axle loads and the total weight of the vehicle, two or more wheel load scales can be combined by cable or multiplexer. The UniMUX (universal multiplexer) can be connected to a standard computer/laptop by cable (e.g. USB) or wireless (Bluetooth). The weighing results can be displayed with the aid of the evaluation software LoadCAT. LoadCAT displays the data of every wheel load scale as well as the axle loads and the total weight of the vehicle. All data is stored in a database for future use. Customer-specific measurement reports can be created and printed out. The DySAW system extension enables the setup as Mobile LSWIM System, especially used for preselection operation. Thereby the number of vehicles per operation can be increased considerably.